I thought it would be helpful to put together a resource page that you can come to for all your Jewelry needs. This page will be added to as I find and use more products or services. Bookmark this page for your reference and convenience. Please note that some of the links below are affiliate links to products that will earn me a commission. These products and services are things that I have experience with and am recommending because they are helpful and are companies that I trust. Enjoy! Blue Nile – People always ask me where they can buy Diamonds online. Blue Nile is one of those places. Why? Because Blue Nile is known for their excellence. Forbes magazine has chosen Blue Nile as their favorite online jeweler every year since 2000! That says a lot! 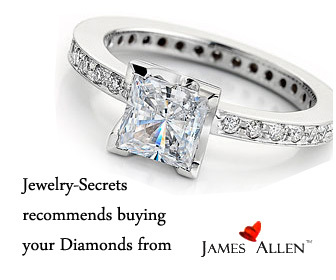 They are the biggest Retailer of Certified Diamonds on the web. I trust them and highly recommend them. Plus, they have a 30 Day Money Back Guarantee! White Ring Guards – White Metal Ring Guards, Medium width, keeps your Rings from Spinning! Yellow Ring Guards – Yellow Metal Ring Guards, Medium width, keeps your Rings from Spinning! Ring Snuggies – Original and Jumbo Plastic Ring Guards. Makes a comfortable fit. Chain Extenders – Makes your Chains or Bracelets longer! Assorted Sizes and Colors! White Gold Heavy Duty Earring Backs – Heavy Weight Earring Backs that won’t fall off. Baby Earring Backs – Little Screw on 14k Gold Backs for Baby’s Earrings. Hypoallergenic Clutch Earring Backs – Earring Backs that snug your ear! These work great and keep the earrings from drooping! Locking Backs – The most secure and durable way to protect your Diamond Studs. The Backs lock in place on special notched posts that is the best you can get! I highly recommend them. Watch Batteries – Cheap Watch Batteries, what more could you ask for? Buy them in bulk. Connoisseurs Silver Polishing Cloth – Connoisseurs Gold Polishing Cloth – Polishing Cloths by Connoisseurs that are great for wiping off your fingerprints and tarnish from Silver or Gold. It makes them sparkle like new! Jewelry Polishing Cloth – Treated cloth that allows you to polish up your Gold and Metals. Perfect for removing small scratches or scrapes. Silver Jewelry Polishing Cloth – Keep your Sterling Silver from tarnishing and turning black. Polish it up like new again! Connoisseur Jewelry Cleaner – The LaSonic Supreme Sonic Jewelry Cleaner. Excellent Cleaner! Blitz Gem & Jewelry Cleaner Concentrate – Mix it with Hot Water and it cleans your Jewelry perfectly! Great for a Jewelry Cleaner or Ultrasonic Machine. Connoisseurs Sonic Jewelry Bath – The LaSonic Sonic Jewelry Bath Cordless Cleaner. Great Jewelry Cleaner for on the go! The Best Ultrasonic Jewelry Cleaner is an Ultrasonic Cleaner that is an Excellent, Excellent Cleaner! I Reviewed a beautiful Stainless Steel, professional Cleaner here! Read all about it…! The Jeweler’s Steam Cleaner – The Brilliant Spa by Gemoro! If you’re looking for a home-use Steam Cleaner for your Jewelry, you will love this. Easy to set up, fill, heat and steam. Works like a charm! Jeweler’s Loupe – 10x Triplet (the best) Jewelers Loupe w/leather case – Chrome. 10x magnification loupes are used by Jewelers and Professionals to view and grade Diamonds and Gems. Ring Cutters – Every Jeweler NEEDS a Ring Cutter! Just to be able to remove a Ring quickly from someone’s finger, safely, is priceless! It’s a MUST have! Extra Fine Point Tweezers – Great for picking up Gemstones, Watch Parts, Melee Diamonds and small screws. It comes in handy! Locking Diamond Tweezers – Diamond Tweezers are necessary for holding Diamonds, Louping Diamonds and Grading them. Locking Tweezers are the best. Gold Testing Kit – Testing Kit for 10kt, 14kt, 18kt, 22kt, Platinum and Sterling Silver! Checks if the Metals are real or not! Comes with a large Scratch Stone. Ring Sizers – Plastic Ring Sizers that allow you to find your correct finger size. Steel Ring Stick Sizer (Mandrel) – Find out what sizes your rings are. Plastic Ring Sizer Stick With Groove – Use this Mandrel to get the right size! Ring Sizers and Ring Stick Set – Ring Sizers and Ring Stick (Mandrel) Set – Great combo if you need to get the correct ring sizes and finger sizes. Gemstone and Diamond Gauge – Measure your Diamonds and Gems to see what size they are. Adjustable Jewelers Saw – Cut Gold, Silver, any Metal or even Carving Wax. Jeweler’s Hammer – This hammer works like a charm on any ring or Jewelry! Jeweler’s Flat Nose Pliers – Jeweler’s Tools that you can’t pass up. Jeweler’s Needle Nose Pliers – Great for wire working! Jeweler’s Shear Cutters – Always needed for cutting and trimming. Jeweler’s Files Pro Lapidary Tools – Buff and File Metal. Reshape rings. File them smooth. An assortment of Files is your best bet. Polishing Compound Kit – If you have a buffer, you’ll need rouge! This 6 piece set will allow you to polish up your Gold, Silver and Platinum easily! Polishing Compound – Polishing Rouge that polishes like a pro! Head Magnifier with Loupe – Magnification for the head so you can work on Jewelry close-up. Jewelers Wax, Carvers Kit – Wax Carving Kit and Tools for both Students and Professionals. Wax Carving Tools – Files and Cutting Tools for Jeweler’s Wax and Clay. Jeweler’s Microscope – Study and view your Diamond with the proper 10x magnification used for Grading Diamonds. Diamond + Moissanite Tester – The Gemologist’s Diamond Authenticity Tester. Tests whether a stone is a Simulant, Diamond or Moissanite! Jeweler’s Scale – American Weigh Scale Bt2-201 Digital Gram Pocket Grain Jewelry Scale, Black. Great for getting Gram Weight, Pennyweight, Ounces and Troy-Ounces! Digital Jeweler’s Pocket Scale – Escali PR100S Liberta Digital Pocket Scale – 100 Gram – 0.05 Gram. Measure things on the go! Pearls – Affordable, Cultured and Freshwater Pearl Jewelry, with some great Deals! Watch Case Back Opener Wrench – Unscrew the back of your Watch so you can change your own Watch Battery! Watch Back Opener – The best tool in the world to snap the back off watches! Watch Case Vise – Holds your watch down so you can snap the back on and off. Watch Case Press – Seals your watch back together again. Some watches can’t be put back together without one. Watch Screwdriver Mini Set – Watches have tiny screws, this screw driver set will do the trick. Watch and Clock Repair Kit – 143 Watch Repair Tools that you cannot live without. If you want to tinker with watches. This is what you need. Watch Band Link Remover – Use what the pros use to remove cotter pins and links from Watches. Juwelo is a mine-to-market jeweler, that buys directly from the mines. They design and manufacture jewelry in a state of the art facility in Thailand. All gemstones are certified authentic and they have a wide selection of gemstone varieties, cuts and settings. Check out www.juwelo.com/ today! Jewelry Case – Great for storing your Jewelry away so they don’t get knotted, tangled or scratched. Wall Mount Jewelry Cabinet – Stand your Jewelry up so it’s protected and visible! Jewelry Purse – Awesome Travel purse to hold all your valuables. Leather Travel Jewelry Case – Take your Jewelry with you on Vacation and protect it at the same time. G.I.A. Diamond Training Course – Learn about Diamonds or Train your Staff the right way. DCA Diamond Training Course – Another Excellent resource for getting Diamond or Gemstone Training. How to Buy a Diamond Book – By Fred Cuellar, one of the best books in the Industry! Diamond Ring Buying Guide – Excellent book by a master of Diamonds, Renee Newman! Diamond Crash Course – My own Diamond eBook that teaches you all about Diamonds quickly, what to look for and what to buy! 101 Ways to Save Money on Diamonds – My own Diamond Saving Money eBook! There are 101 effective ways to really save a LOT of money when buying Diamonds! It’s well worth the small price. Check it out! Quicktime Pro – One of the best for converting Movie Files to MP4’s so you can upload them to Youtube or your website! Pinnacle Studio – I love this software program. I’ve used it for years. It’s what I use to make my videos, splice them together, add captions, music and transitions. Love it! Highly recommend it for it’s easy to use interface. Flip Video Camera – What I use to shoot all my videos with. Awesome quality! The flip comes in black and white and shoots 60 minutes of Video. Very easy to use. Compact. Great videos, can upload directly to Youtube. Adobe Photoshop – Photoshop is the best photo editing software in the world. Made by Adobe, Photoshop is what all the professionals use. It’s what I use to clean up my images with and create all the images for this website. Great tool! Minolta SLR Camera – What I use to photograph my Jewelry with. Make sure you buy the Macro Lens for good close up shots. Canon Rebel Digital SLR Camera Kit – Another awesome camera I use and love. Great for taking photos that are crisp, clean and professional. Nikon Coolpix P90 Digital Camera – Awesome all around camera. Takes unbelievable shots of Fireworks! Plus, it has an incredible 24x optical wide-angle Zoom that goes from (26mm) to super-telephoto coverage (624mm). Very impressive! Portable Photo Light Tent – Lighting is extremely important if you want to take close up photos of Jewelry with no shadows! You must get one! Light Box Photo Studio – 6′ Lamp and Stands, 30″ Photo Tent works perfect together. Got Print – If you want Business Cards, you must use Gotprint! The cards are excellent, heavy weight, full color and CHEAP! You will love them. I’ve used them for over 6 years and would never use another company. I love Gotprint! E-Junkie – the best shopping cart system for your website that allows you to sell products or digital goods. And their prices are very CHEAP! I use them to sell my ebook! Simple and easy! Paypal Pro – This allows me to offer customers to not only pay through paypal, but also be given the choice to pay with Visa or Master Card. Excellent service that converts more sales. Elance – I’ve used them for years with outsourcing things that I can’t do, or don’t want to do. Like making an Iphone App, or Researching Content for a website, Writing Articles, Hiring Graphic Designers, getting Logos made… Anything you can think of, service or trade, everyone is available for hire here. Check them out!